Ready to totally trip out and wonder what the heck you are seeing? 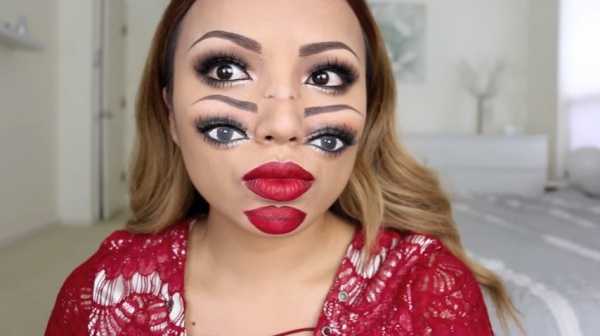 Take a look at this insane double vision makeup tutorial by YouTube sensation, Promise Tamang. This gal can seriously make anything happen with the power of makeup and has over 4 million subscribers from her transformations for Disney characters like Elsa, Cinderella, and The Little Mermaid, but she even outdoes herself on this one. Have you watched it, yet? If not, take some aspirin first because my head is still spinning from trying to focus on what I’m seeing! Ready? Totally confused and slightly crept out? I am, too! 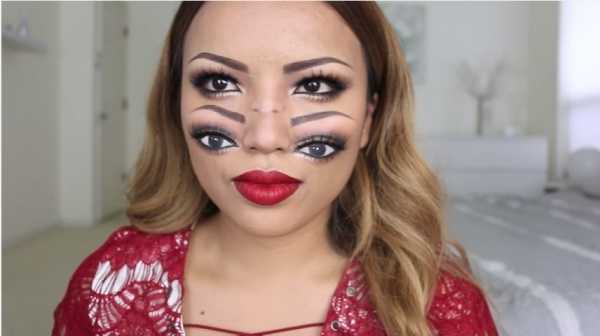 I have never seen a makeup tutorial like that before. 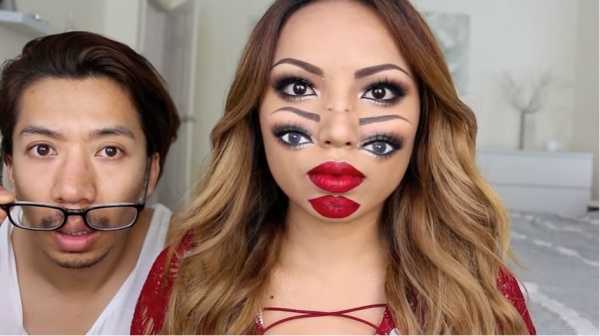 Tamang can somehow draw a second set of lips and eyes on her face to trick your eyes into thinking you are seeing double. 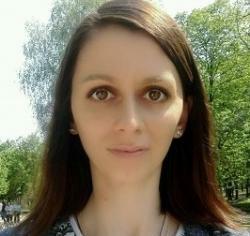 All with makeup! And, let’s be honest, some serious talent and a precise hand! Thinking that this would be the perfect Halloween idea? I don’t blame you. But you better start practicing now because, while she makes it look easy, it takes extreme precision and attention to detail. Start by drawing a second set of brows that slightly overlaps your own. Make sure you match the color as closely as possible and use short strokes to imitate hair. Paint on a second set of eyes below the brows. One eye will be on your nose and the other on your temple. Include a set of falsies to really pull it off. Next, comes the really hard part (did you think it was already hard? Just wait!). This step is one that requires expert contouring, shading, and highlighting. Take a deep breath and draw on four extra noses. Try to mimic your actual nose’s shape and size as closely as you can! Finally, draw on four more pairs of lips under the noses that you just finished. Choose the same shade that you will be wearing all night long and make sure you reapply it on your actual lips as it wears off. That is the very basics of it! Are you looking trippy, yet? 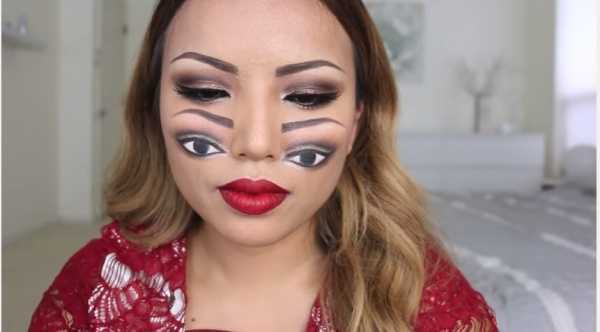 Have a headache from trying to focus on your own face? If you did not quite pull the look off, do not beat yourself up about it. This is definitely not for the beginner. But if you can pull it off, you will have people giving you second (and third!) glances all night long! Just don’t be surprised if they start to avoid you, too! 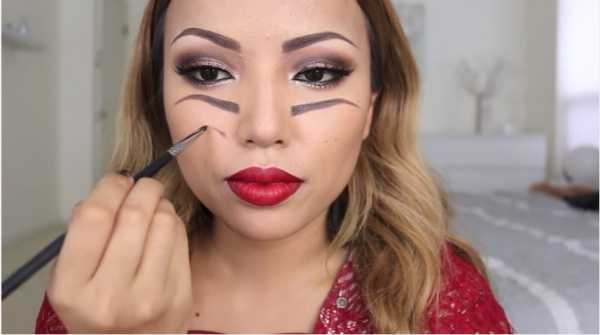 If you definitely want to be the most-talked about the person this year at a back to school party or Halloween, get your brushes out and start practicing now. October is just around the corner and we have a feeling it may take that long to perfect this optical illusion. Prepare to be dizzy. Seriously, my head is still spinning from looking at the video and pictures!